I’m heading to Kansas City tomorrow for the World Science Fiction Convention! Here’s where you can find me. A panel of aspiring Evil Overlords need Minions to carry out their evil biddings. But now that minions have heard of collective bargaining and have seen what non evil overlords offer their workers, it isn’t as easy as it once was. Most authors agree that short stories don’t pay the bills, but authors who are known for writing novels frequently turn their attention to the shorter forms. If it isn’t for the money, why do they spend their time and energy writing short stories? Kate has been home from the hospital for a bit over two weeks now, working with in-home physical, occupational, and speech therapists once or twice a week each. She is still weak and wobbly — using a walker even in the house — and the aphasia is still pretty bad, but I believe both are improving. It’s slow and not consistent, but on average I think she’s getting a little better every day. In fact, she’s doing so well that the physical therapist thinks she ought to switch from in-home to outpatient therapy soon… maybe next week. We’ve also signed up with an in-home health care firm. We have two different caregivers coming over on Wednesday and Friday afternoons. This will let me get out of the house or focus on tasks without having to worry about Kate. We are still figuring out how best to make use of their help while they are here, but it is helpful just to be able to take my mind off of Kate’s care for a couple of afternoons a week. We met with the oncologist on Monday. He’s satisfied with her progress since the surgery and we are planning to start Avastin infusions in two weeks. The genetic testing isn’t back yet, but he says it’s unlikely to result in a big change in treatment. I’m not really happy about Kate getting an infusion every two weeks for the foreseeable future, but if it keeps the cancer from coming back I suppose it’s worth it. We are also ramping down the steroids (currently 6mg per day, down from 8mg) and pain meds. Next MRI is scheduled for this Saturday; this one is mostly to set a baseline for future scans. We had an unplanned trip to Seattle last weekend, to visit a dear friend in the hospital there. She’s been hospitalized for more than a week and doesn’t have a diagnosis yet, which is worrisome. Many of you know who I’m talking about, and if you do I hope you’ll spare some good thoughts for her. The trip was stressful for a variety of reasons but Kate came through it like a champ. As you may know, I had to cancel my planned readings in San Francisco this coming weekend. However, Kate’s sister is coming down from Seattle next week to stay with Kate while I attend the Worldcon in Kansas City. I hope to see some of you there. So, all in all, things are not going too badly. I hope that we will continue to see slow but steady progress in the coming weeks. 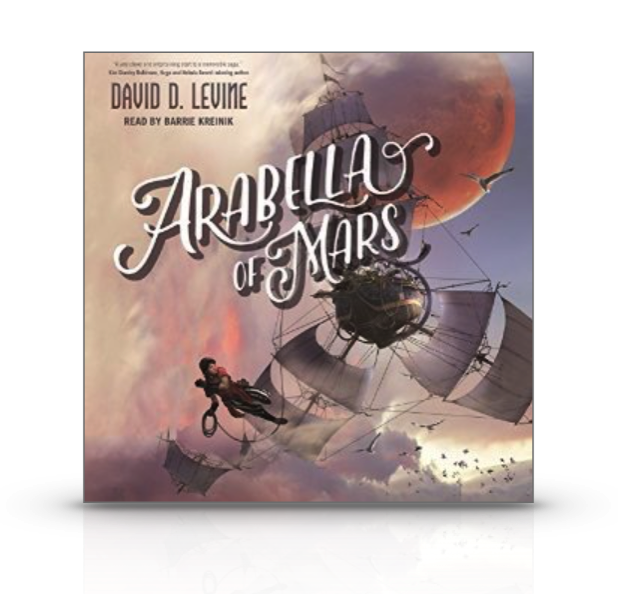 I’m very pleased to announce that the highly-anticipated audiobook of Arabella of Mars is now available at Audible, Amazon, iTunes, and other audiobook vendors. The narrator is Barrie Kreinik and I am extremely happy with the sample I have heard. 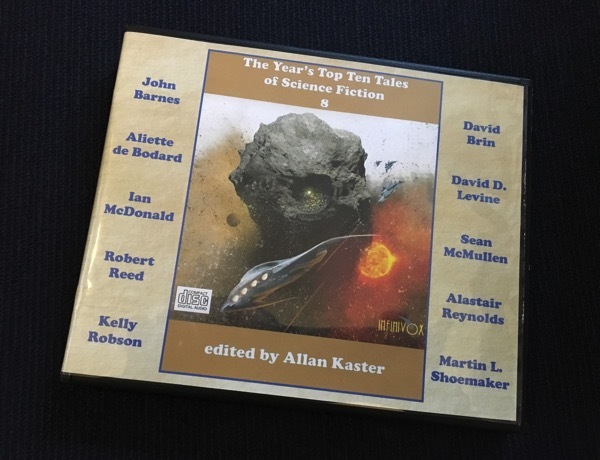 I have also received my author copy of audiobook anthology The Year’s Top Ten Tales of Science Fiction 8 from Infinivox, which includes my Nebula-nominated story “Damage,” narrated by Nancy Linari. This one doesn’t seem to be available in stores yet but I’m sure it will be soon. As most of you already know, my wife Kate has been extremely ill and spent almost the whole month of July in the hospital. She is back home now, but requires a lot of care. Her sister Sue has very generously offered to come down from Seattle to take care of her while I’m at the Worldcon, but her vacation time is finite and she can’t manage the previous weekend as well. Therefore, with extremely great regret, I find that I must cancel my SF in SF and Writers with Drinks readings. To say that I am profoundly disappointed at this turn of events is an understatement, especially given the relatively short notice I can give. I’d like to publicly thank the organizers of both events for making the space for me in their schedules, and I’m very sorry to let them — and my friends in San Francisco — down. I hope to be able to reschedule both events for some time in the future. I’ll be reading from Arabella of Mars in Seattle on Friday! Friday, July 29 at 7:00pm (that’s TOMORROW!) I will be reading from my debut novel Arabella of Mars at the U District branch of the University Bookstore in Seattle. But I’m not just going to be reading and signing books — I will also be rapping, and leading a singalong, and giving away freebies… in costume. I hope that you will attend if you can, and if you have a Regency or other steampunky outfit I hope you will wear it. It should be a lot of fun. Tell your friends! Thanks to Hal O’Brien for the photo. Extra special thanks to Kate’s sister Sue for making this reading possible by her continued support above and beyond the call of sanity. 07-28-2016 at 06:46 PM Comments Off on I’ll be reading from Arabella of Mars in Seattle on Friday! Kate is finally home from the hospital. This is the first time she’s been home since we left for Westercon. She’s very glad to be home. Kate has been doing well in rehab. She is talking better, walking better, and has more energy than she did last week, and we now expect that she will be able to go home tomorrow (Monday 7/25). That being said, she still requires a lot of support and cannot be left alone, so we are going to need a lot of help in the coming weeks. In particular, if you are in a position to bring by some food we would greatly appreciate it. It would be best if you could bring dinner for 3, with no mushrooms, in freezer-ready containers. We will also be able to use your help performing errands, shopping, and cleaning. We will be using MealTrain to schedule helpers… watch for an email from me as soon as we figure out our schedule. We are planning to have some kind of home health care. Unfortunately, our first pick agency couldn’t work us into their schedule and our second choice hasn’t yet returned our call. We hope to hear from them on Monday. In addition to home health care for Kate’s daily activities, she’ll be getting visits at home from physical, occupational, and speech therapists several times a week. Eventually this will shift to outpatient therapy and then, as she gets more functional, taper off to nothing. We finally got a visit from the oncologist with the pathology report. To no one’s surprise, the new tumor is another glioblastoma. They’ve sent off a sample to Foundation One for genetic testing, which may identify some additional options for therapy going forward. In the meantime we will focus on recovering from the surgery and reducing her steroid dose (currently 12mg per day, down from 16 last week). In the next few weeks we’ll get the Foundation One results back and have another MRI and we will know more about what kind of treatment she’ll get in the coming months. Sorry, it’s been a while since my last public post about Kate. When last I posted she was just being transferred to St. Vincent for more tests and possible brain surgery. Well, as it turned out surgery was required. She had the procedure on Tuesday, and it was successful, removing “in the high nineties percent” of the mass, which was some kind of glioma. We won’t know more, including the treatment plan, until we see the pathology report. 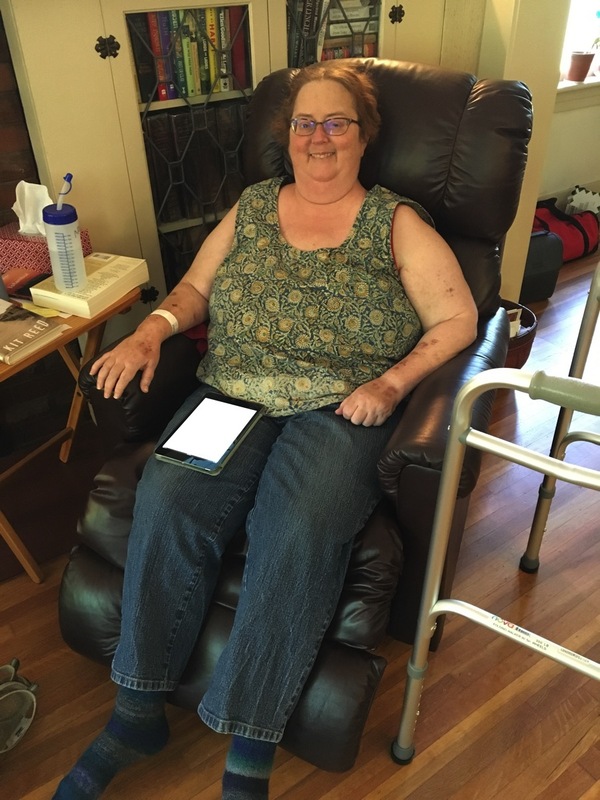 Kate spent a few days at St. Vincent recovering from the surgery, then was transferred to the inpatient rehabilitation unit at Providence in NE Portland. She is working with physical, occupational, and speech therapists for several hours a day and will be here for a week or two until she is well enough to go home — with the support of home health care, if necessary. We’ll know more when we get closer to discharge. I had good readings in San Diego and LA last weekend, and will be heading to New York tomorrow for my reading at the KGB Bar on Wednesday, returning late Thursday. Sue is holding down the fort in my absence. If you are in town and willing/able to help her out July 19-21, please contact her (or me, if you don’t have her contact info). I do hope to be able to do the remaining stops on my book tour, but we are taking it one day at a time. 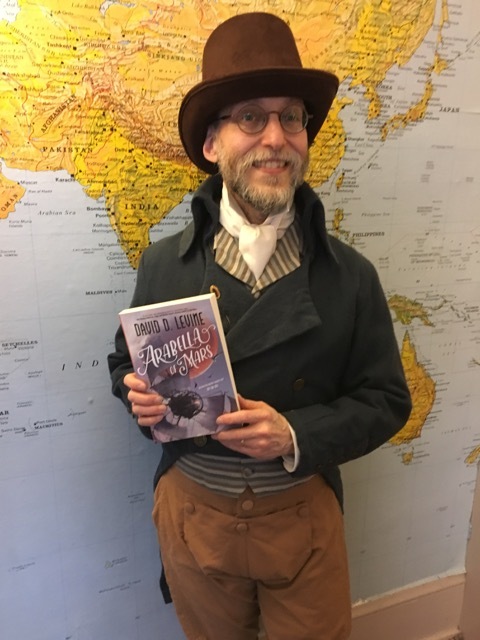 On Friday July 15 (that’s TOMORROW), I will be reading from my debut novel ARABELLA OF MARS at Mysterious Galaxy Books in San Diego. But I’m not just going to be reading and signing books — I will also be rapping, and leading a singalong, and giving away freebies… in costume. I hope that you will attend if you can, and if you have a Regency or other steampunky outfit I hope you will wear it. It should be a lot of fun. The next day, Saturday July 16, I will be participating in Shades & Shadows 17, a group reading including Paul Tremblay, Stephen Graham Jones, Vesta Vaingloria, Glen Hirshberg, and Sara Gran. Date and Time: Saturday July 16 at 8:00pm. Doors open at 7:30, please plan to arrive by 7:00. I hope that you can attend one (or even both!) of these, and that you will share the news with your friends in the area. Hope to see you there! Wednesday, July 13 at 7:00pm (that’s TONIGHT!) I will be presenting the first public reading of my debut novel Arabella of Mars at Powell’s Books at Cedar Hills Crossing. But I’m not just going to be reading and signing books — I will also be rapping, and leading a singalong, and giving away freebies… in costume. 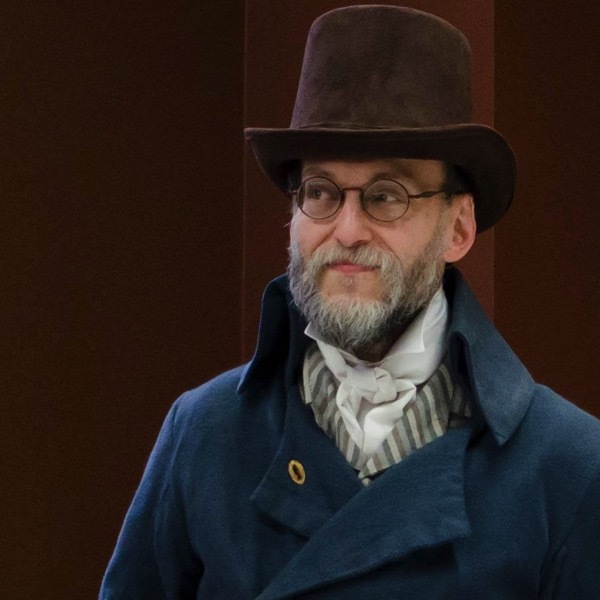 The PDX Broadsides musical group will also be performing. I hope that you will attend if you can, and if you have a Regency or other steampunky outfit I hope you will wear it. It should be a lot of fun. Tell your friends!